Can I do anything with this pony?! ok, so basically, is there anything competitive I cna do with this pony. He's pure connemara, 11/12 yrs old and 14.1/2hh. Can go in an outline, but would need several weeks schooling to do it and still wouldn't be perfect. Will jump a 80cm course currently happily. 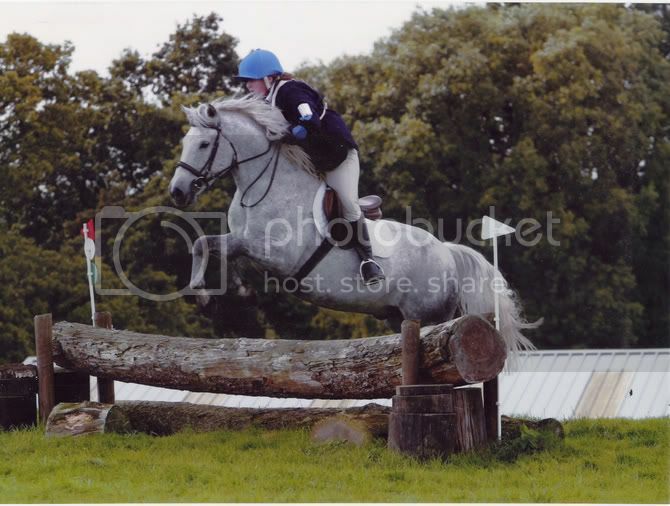 Used to not jump anything scary/water/ditches etc. Has now done several 2"3 events very well, generally getting placed in top 5 out of 30ish competitors. Is starting to do water. He has a splint on his front left leg and a small melanoma( probably benign) under his tail. He's nice natured, but no big movement etc. He will jump a course at speed, but can be slowed down a bit. He rarely has poles off but isn't keen on jumping big/scary jumps ,although we haven't tried them in a few years. He's currently out in a field without shoes (has been for about 2 months) until I want him in. I was thinking of leaving him out a year, then bringing him back in and schooling him to work properly and maybe mountain and moorland/2"9 events(thats being brave..stilll don't know if he'll do the ditches!). We did try to sell him last year, but he was too much for the wee girl, napped, bucked etc. lol, shame your not in ireland! He is lovely, but just cannot be pressurised. I don't know the ins and outs of mountain/moorland and ridden classes but wondered if they might be worth trying? Working hunter is a no no as the fences are quite big I think? i too would have him but i live quite a way a way! Could he do M+M? And can I ride him in them? I mean, presumeably his splint will mark him down? Last time we did any sort of showing (the native challenge) he was placed first, of the ponys who didn't go in an outline (it was obvious how it had been marked, and correct I believe) but not sure if he's good loooking enough or what it involves?